Growing hair is a task not meant for the faint-hearted. It sometimes comes with a lot of struggles like the awkward-length-phase, bouts of hair loss, and the constant urge to want to chop it all off. And while a pair of shears may seem like the most appealing thing when you are going through one of these crisis situations, there are some aids you can lean on to ease and boost the hair growth process. 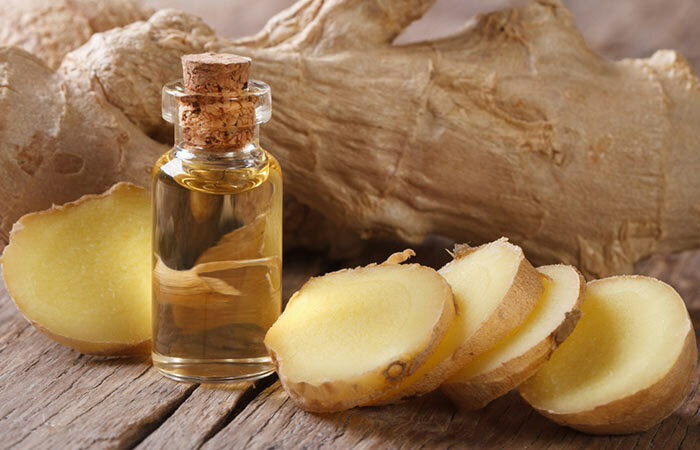 Following is a list of 7 natural treatments using ginger that promote hair growth. But first, let’s talk about how exactly ginger aids hair growth. How Does Ginger Aid Hair Growth? A fresh ginger root contains magnesium, potassium, phosphorous, and vitamins that provide your hair follicles with nourishment, making them strong and preventing hair loss (1). Dandruff and hair loss often go hand-in-hand. This happens because the dead skin cells clog your follicles, leading to hair fall. 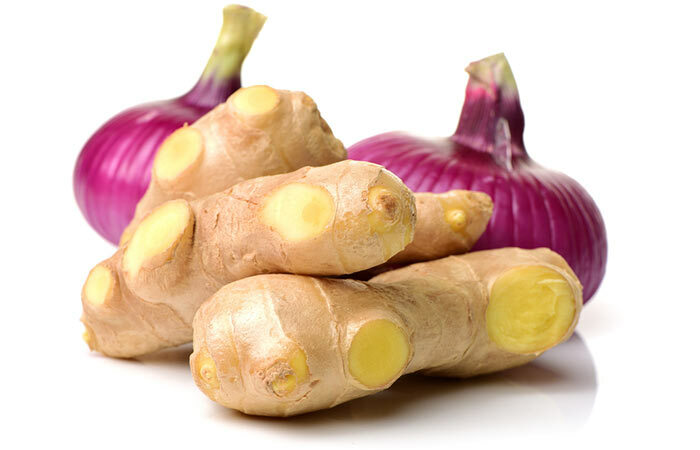 Ginger has potent antimicrobial properties that help control dandruff and, in turn, curbs hair loss (2). Dryness causes hair to become brittle, and this leads to breakage. Ginger acts as a natural conditioner, tackling dryness by restoring moisture to your hair (3). 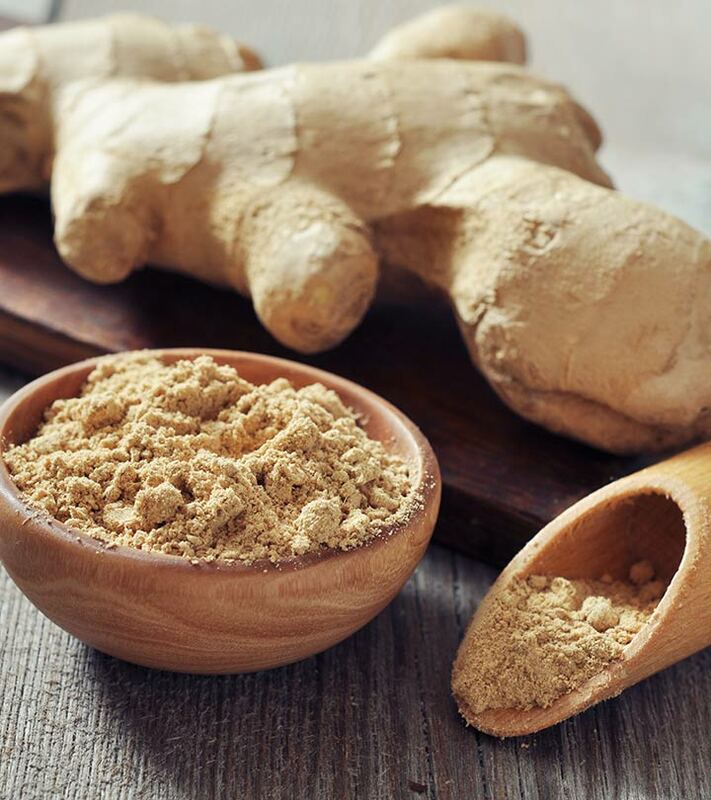 Ginger’s active ingredients, gingerol, helps relax blood vessels and thereby improves the circulation of blood (4). This allows for the improved nourishment of hair follicles, ensuring faster hair growth. Ginger also contains chains of fatty acids such as linoleic acid which nourish your hair, keeping it healthy and strong (1). 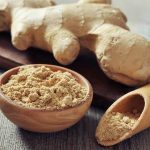 While these properties of ginger make it an excellent hair growth ingredient, there is often some confusion when it comes to what form of ginger to use in remedies. Using ginger in its powdered form might be the convenient option, fresh ginger root contains more of the essential nutrients that make it beneficial for hair care. Some powdered ginger products may contain coloring agents that may leave a yellow tint on light hair. Keeping that in mind, you can incorporate ginger into your hair care routine by following the DIY treatments listed below. Combine the ginger paste and the carrier oil in a bowl. Section your hair and start massaging the ginger oil into your scalp using your fingertips. Once your entire scalp is covered in the oil, massage it for an additional 5 minutes to improve blood circulation. Leave the oil on your hair for at least 30 minutes and then rinse it out with your shampoo. Repeat this treatment twice a week for best results. The ginger combined with the conditioning properties of oil will nourish and strengthen your hair, ensuring that it grows out thick and healthy. Blend all the ingredients together until you get a fine, consistent paste. Apply this paste to your scalp and hair and leave it on for 30 minutes. You can use this hair mask twice in a week. 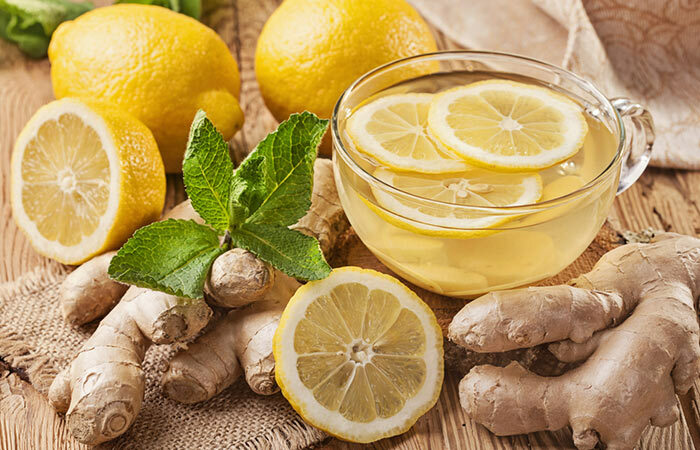 The collagen boosting properties of lemon combined with the antimicrobial properties of ginger work together to restore the pH of the scalp while promoting hair growth. Blend the grated ginger with a small amount of water until you get a slightly runny consistency. Apply this paste to your scalp and let it sit for 45 minutes to an hour. 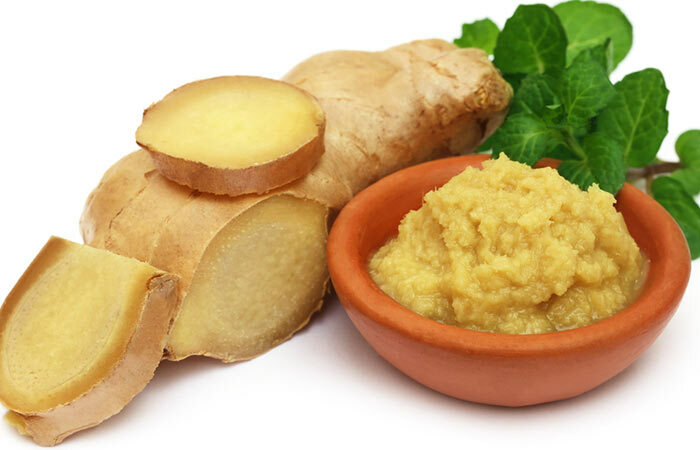 Use this ginger paste twice a week if you’ve been experiencing severe hair fall. 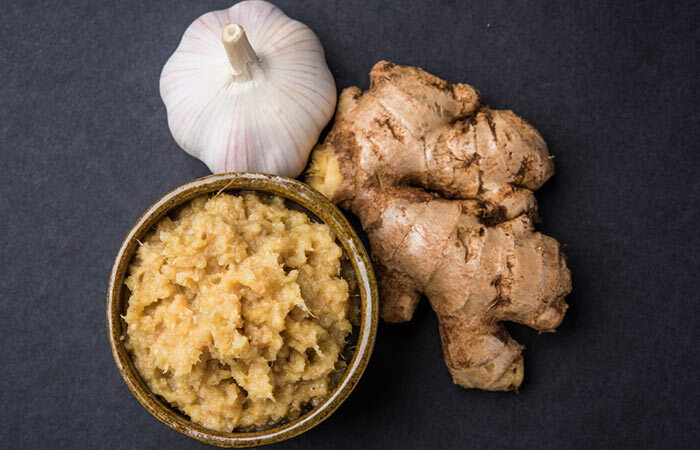 The ginger paste with its potent antimicrobial and nourishing properties will tackle hair fall and stimulate hair re-growth. This is one of the simplest and most efficient ways to use ginger in your hair care routine. Boil the Moringa (drumstick) leaves and grated ginger in a 2 cups of for 5-10 minutes. Once the concoction has cooled, strain the liquid and set it aside in a jug. Shampoo and condition your hair and then pour the liquid through it as a final rinse. Use this rinse once a week. 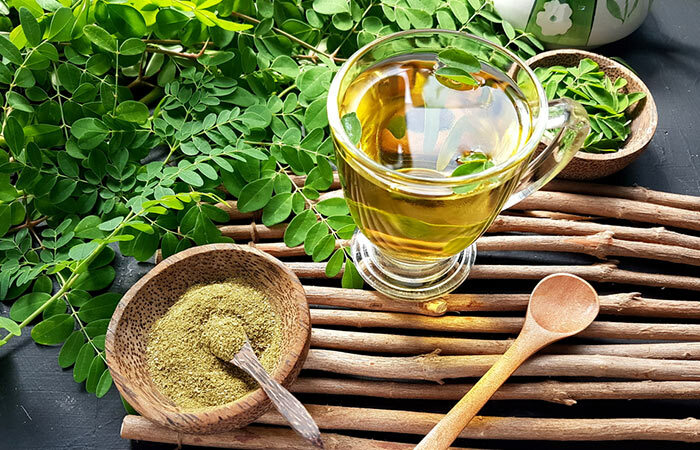 Moringa leaves contain calcium, zinc, iron, copper, potassium, manganese, and magnesium. It is also rich in vitamins A, C, D, E, and K, and is known for its rich content of antioxidants that help keep hair healthy and free from damage. All of this when combined with the beneficial properties that ginger has to offer, creates the perfect hair care potion that ensures healthy hair growth. Blend all the ingredients together until you get a consistent paste. Start applying the paste to your scalp and hair in sections. Once your hair is covered in the paste, let it sit for 30 minutes. You can use this mask twice a week. 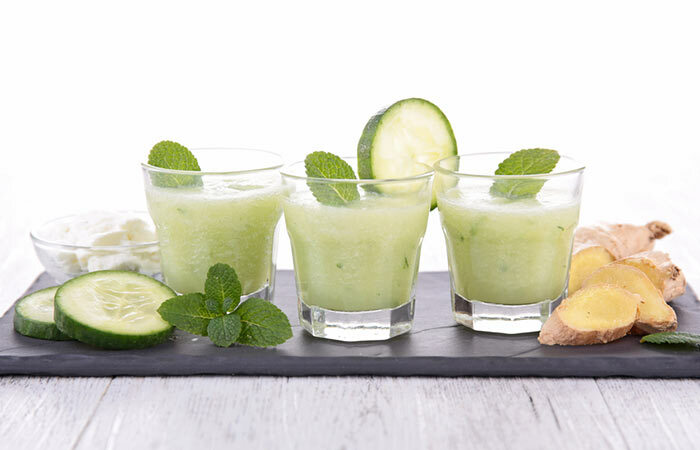 The silica, sulfur, and vitamin A in cucumber boosts hair growth while the antiseptic properties of basil help combat issues such as dandruff. Squeeze the grated onion and ginger in a cheesecloth and collect their juice. Use a cotton ball to dab this juice onto your scalp. Wait for 20 minutes and then wash your hair. You can repeat this treatment thrice a week. Onion is a rich source of sulfur which helps in follicle regeneration. This mixture helps stimulate hair growth from the dormant follicles, making your hair thicker while speeding up hair growth. Blend the ingredients until you get a smooth paste. 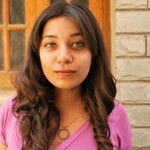 Section your hair and start applying the mask to your scalp and hair. Once all of your hair is covered, let the mask sit for 30 minutes. You can use this mask twice in a week. Garlic is another ingredient that is rich in sulfur. It also helps stimulate hair growth from dormant hair follicles. The mask also helps repair damage with the help of the honey, coconut milk, and coconut oil. While honey conditions your hair, the coconut milk, and oil nourish it, making it healthy and damage-free. Not only are these treatments quick and easy, but they are also super easy on your budget. There is no point in spending money on chemical filled hair care products when you have such natural and efficient treatment options at your disposal. While growing your hair is not for the faint-hearted, these treatments can make it easy, and with them, you will have the locks from your dreams in no time! Have you ever tried ginger for hair growth? If so, how did it help you? Tell us your story by commenting below. How To Use Carrots For Hair Growth? How To Use Garlic Shampoo For Hair Loss? Do you know that garlic can be used to improve hair growth? To be more specific it has the potential to not only boost hair growth but also stimulate hair regrowth.